New CD Of Leon Rausch "Time Changes Everything"
This new CD features 15 cuts of which 10 are brand new recordings featuring the voice of this Western Swing vocal legend. 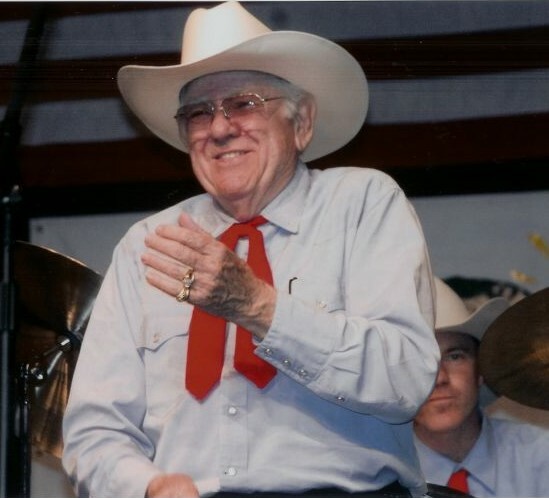 The remaining five cuts are four live spoken word pieces of the great Bob Wills, Leon's longtime boss and a 1987 intro to Leon and his group at the White House. Leon is backed on this album by so many wonderful musicians including the steel guitars of album producer Tommy (Waco) Spurlock on most of the cuts and that of the great Bobby Koefer on two cuts. Also very prominent are the fiddles of James Pennibaker, James Faver and Glen Duncan. So many other wonderful musicians are heard on this album including the piano playing of both Floyd Domino and Wayne Glasson. All of the cuts are from the Bob Wills songbook with the exception of Rich O'Brien's Bob Wills tribute Taking Bob Back to Tulsa. The album opens with Fred Rose's Deep Water and also includes Rose's Rose of Old Pawnee. Also heard are two of Cindy Walker's masterpieces, Dusty Skies and Bubbles in My Beer with Paulette Carlson joining Leon on vocal on that one. Rodney Crowell guest vocals along with Leon on Ida Red. Both Bobby and Tommy's steel guitars are heard on Corrine, Corrina. Also brought back are Fan It, Tommy Duncan's Time Changes Everything and 4 or 5 Times with Bobby on steel. This album can be ordered for $10 plus $3 for s&h from Tommy Spurlock, 351 Buckhorn, Azle, TX 76020.